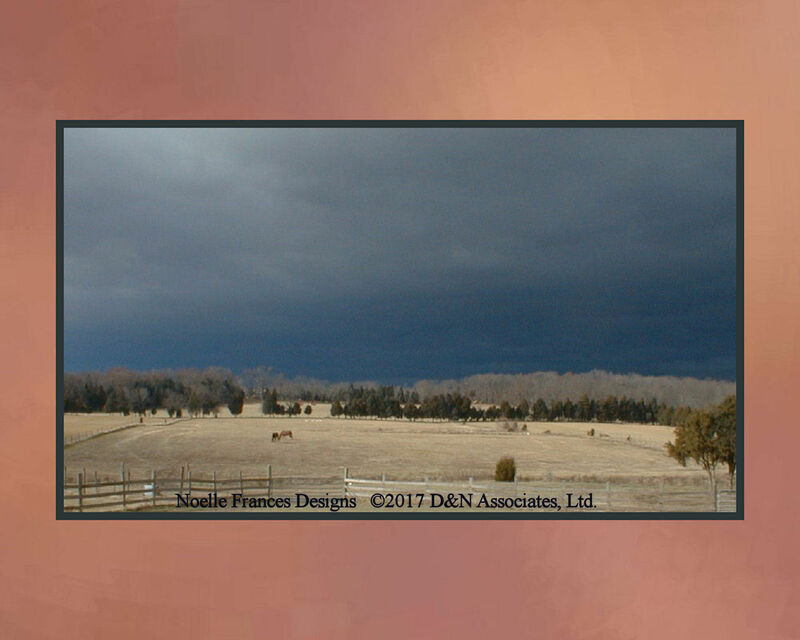 This photo of a late season winter sky before a heavy snow storm influenced my choice of the grey-blue thread colorway and name for this booklet. 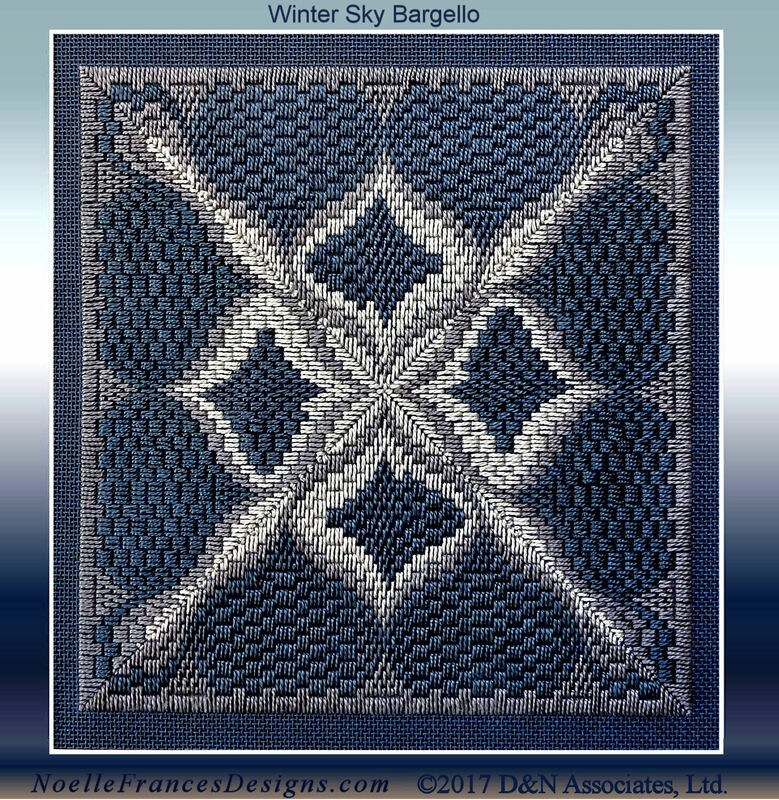 Winter Sky Bargello is a variation of my Citrus Pomegranate Design that is presented in Section 10 of the Citrus Pomegranate Design booklet. I have decided to release Winter Sky design within its own booklet as an intermediate level design. For example, within the Citrus Pomegranate Design booklet I discuss Getting Started over several pages. Within this booklet I assume that the intermediate level stitcher has their own preferences as to which needle to use, where to start on the chart (outwards in, center outwards, etc.) and so on. 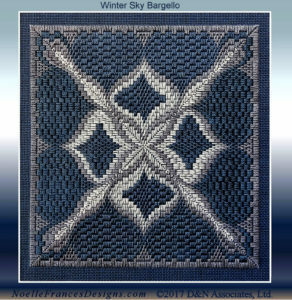 Winter Sky design is a Bargello counted needlework embroidery presented within a 25-plus page full color booklet. Design count is 145w by 145h. Work area is approximately 8 inches square on 18 count fabric. This Bargello design may look complex, but this design is easy to stitch when you follow my booklet’s numerous pages of zoomed-in charts and photos. My booklets are divided into sections that discuss the main pattern parts of each design, present photos and graphed charts in color and close-ups so you can see the details. Within the e-book format you can expand the charts and photos throughout the booklet to view details down to individual stitches. 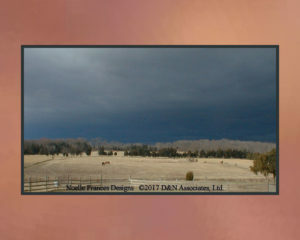 Finish as a pillow or can be mounted in a framing mat and display, as I did, on a black iron easel.